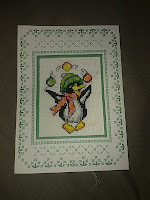 Myzdamena's World: My First Christmas card! Oh how lovely is that. And how smug do you feel now you've got 2010's cards underway! !